You can read all about our culturally rich community, spirited student life, and academic opportunities, but the best way to learn about IU is in person, at one of the diversity programs below. 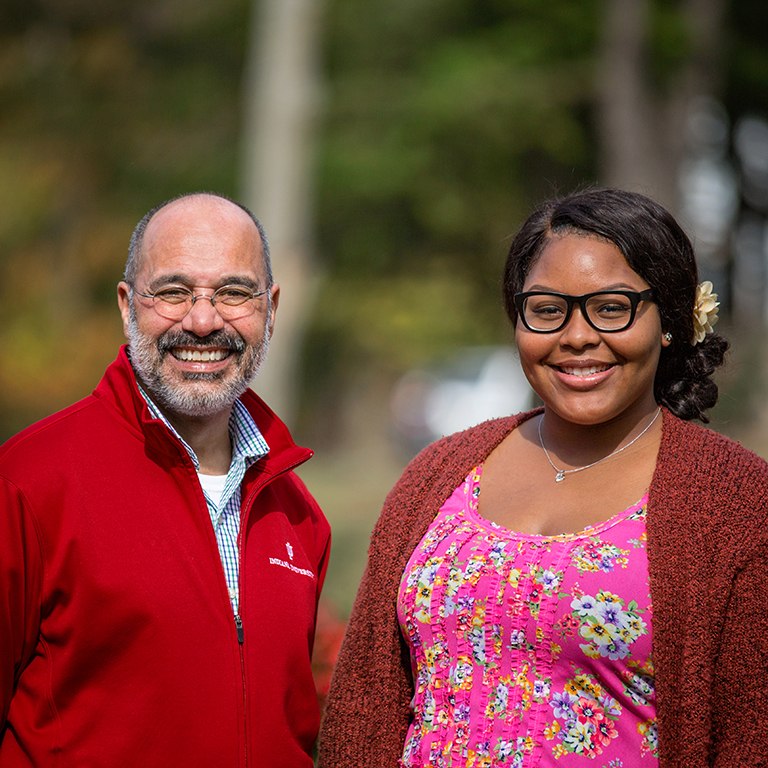 These events also present a variety of opportunities to talk with current Hoosiers, meet other prospective students, or connect with staff like Khala Granville Ashaolu from the Office of Admissions. All these events are by invitation only and require a reservation. Questions? Please call 812-855-0661 or email Khala Granville Ashaolu at kgranvil@indiana.edu. Dajah Humbert was determined to go to a college outside of Indiana until she attended a Red Carpet Day at IU and was invited to the “Lunch with Larry and Campus Partners” program. At the luncheon, she met other prospective and current students and IU staff members. She even learned about a wonderful scholarship opportunity with Hudson and Holland. According to Dajah, "If I did not attend ‘Lunch with Larry,’ I would never have gotten that amazing scholarship." Explore IU is a unique opportunity for historically underrepresented juniors and seniors. IU faculty, staff, and students will be on hand to share information, provide guidance for college preparation, and answer questions about admission to Indiana University. Lunch, entertainment, and special workshops will be provided. Held in northwest Indiana, Fort Wayne, and Indianapolis, these events are for admitted students and their families. You’ll have an informal meal with IU alumni, students, faculty, and staff—a great chance to ask questions and get advice on preparing for and succeeding at IU. More information will be available soon. Admitted students and their guests are invited to lunch as part of the Red Carpet Day experience. Campus partners, Office of Admissions staff, and current IU students will be available to answer your questions as you finalize your college plans! More information will be available soon. This program is for admitted minority students. You’ll hang out with current IU students, meet potential classmates, and find out about orientation. You’ll also learn about academics, culture, student organizations, and other aspects of IU life. More information will be available soon. Students in grades 8–10 in the Indianapolis area are invited to attend Reach IU at Ben Davis High School. This program introduces students and their parents to the many academic, social, and cultural opportunities at IU Bloomington. Scheduled activities include a career exploration workshop, parent workshop, and resource fair. Admissions staff and current IU students will be available to answer questions.